Hello, listeners! Carol here. 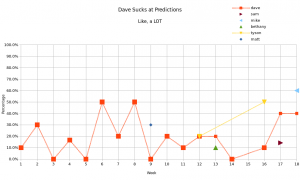 If you’re wondering, here’s an update on Dave’s prediction accuracy. He still hasn’t gotten past 50%. Congrats to Mike, who is officially our most accurate guest! He did give himself a bit of an advantage by only predicting winning teams and not scorelines, but he still managed a 60% accuracy rating on what he did predict. Good work, Mike!